Canyon Lake Vacation Rental #13585 LakeHouseVacations.com Rent Me! Winter Texans Special!! 22 Located right on the Comal River! Spacious ground floor 22 condo on the Guadalupe River! Under new ownership! Updates coming soon! This spacious 2/2 condo at Inverness Condominiums is located right in the heart of New Braunfels. With Schlitterbahn right across the street and the Comal River right out your back door with direct river access, this is the perfect vacation spot. This open living concept has a roomy living room/dining area and a fully stocked kitchen. The two bedrooms both have a Queen size bed and a private bath and there is also a Queen size sleeper sofa for additional guests. High quality linens are provided for beds and bathrooms. Come and relax for a weekend or a full week at this wonderful river condo. Rockin' R is a local tube outfitter which can pick up 2 lots down from Inverness Condos between Memorial Day and Labor Day. For any reservation outside of that time period, the Rockin' R shop is located only .5 miles away. You are provided 2 parking passes, one for a numbered covered spot and a second for general parking. This condo is on the third floor and there is an elevator. Guests must be 25 years of age or older to make a reservation and must be staying at the property. No pets allowed. Guests will be provided with 6 wristbands (max amount allowed). This condo has a maximum occupancy of 6 guests. This maximum occupancy is not to be exceeded at any time. No daytime guests allowed. This was a great place with plenty of room for a family of 5. The place could use a modern upgrade but for the amount of time we spent in the condo it was great. It beats a hotel any day of the week. We would totally use New Braunfels Escapes again; I would totally recommend them. " My stay was fabulous enjoyed time with the family and enjoyed schlitterbahn!" Condo is in the perfect location! It was very clean and is stocked with just about everything you need! It was a busy weekend, and yet the condo was so quiet! Never heard any noise from neighbors! Had an issue with the WiFi, but the property manager had it fixed right away. Would absolutely stay there again!" Location was great. Condo was a bit outdated for the price. Was good enough but nothing really nice. The toilet overflowed the first day so we had water all in the floor that we had to clean up, which wasn't fun. The parking situation was terrible and extremely frustrating. Every evening regardless of when we got back there were no spots and we were told we couldn't park in the reserved parking. I mean, we paid a lot of money to be there and can't park? That situation needs to be handled. Probably wouldn't stay there again. " Great location, no river view but nice trees/hidden from traffic. Very clean. Parking is a pain. Great pool, drop off to river very accessible. Comfy beds, old and flat pillows. Great kitchen. Stackable W/D was a nice surprise. Would definitely stay again! " Place was nice. It does not overlook the water and the dishes need to be checked when you get in... but other than that, totally worth the money and the location! " 2 bedroom very nice and clean. Only complaint is that the beds are small and uncomfortable. 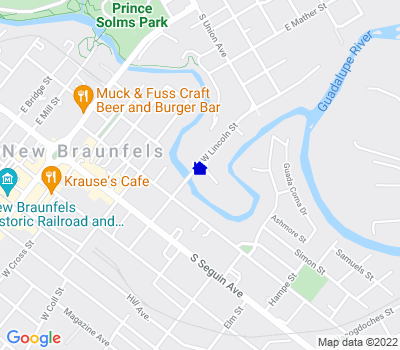 Very centralized location to explore New Braunfels and surrounding area. Decent climb down stairs to get to pool and river. Pool is clean and river is easy to access. " We had a great time..will absolutely come back next summer." We enjoyed our stay here. Some things that I didn't like: 1) the pool was pretty small for the number of was crowded with only 6 people in it. 2) There was only one place to get into the river from the property and people tended to congregate there so it made it difficult to get in and out. 3) the river current is strong there which made swimming and enjoying the river difficult (with there only being one access point from the property) I think 2 access points at opposite ends of the property would have made it easier to get in float a little ways enjoy the river and then get out at the downstream access. 4) The beds at this location felt as if they were 20 years old or more....very worn and a bit uncomfortable. Overall, I probably won't stay at this property again since swimming in the river and pool is one of the major attractions we go for. I would recommend this property for families that just need a nice comfortable place to stay while they enjoy other activities in New Braunfels. We went to Schlitterbahn but ended up driving since we had a few things to carry (you *could* walk there but it would have been hot and uncomfortable), we also rented tubes from Landa Falls and floated the river and what was nice was we could exit the river at our property and eat lunch and use the bathroom, then get back in and complete the float, we did the float twice which pretty much took the entire day. " It was a great time, the condo was ok. The beds are not comfortable and the view in the pictures are nit accurate. Over all a good stay "
We have stayed at the inverness many times but it has been a few years since we were there. We were very disappointed. While our room was clean the beds were very uncomfortable and need to be updated. The worst part was the condition of the pool and hot tubs. They were so filthy we couldn't even get in. We took pix it was gross. We paid $587.54 for two nights in miserable beds and couldn't even use the pool and/or hot tubs. I feel I didn't get what I paid for at all." We loved the location and the customer service was great and responsive when we had an issue with the TV. The unit itself was out dated. The owner needs to update the electronics. Also, pool area was very dirty. The color of the pool/Jacuzzi was green and opaque...gross!" The place is could use some updating but for the price it was great I travel 100% for work so it is a much nicer stay then a hotel. My only problem with the place was the kitchen sink smells very bad. The garbage disposal does not work so I think there is some rotting food down in there. The parking was very limited and pretty hard to park a full size truck in the lot. Other then that the place was great "
The condo was perfect, it looked exactly like the picture. The only complaint we had was the floss were extremely dirty, other than that I would definitely rent again. Extremely satisfied. :-)"
It was our first time going to New Braunfels so we really enjoyed our stay. There were some things that could be improved but none that took away for our experience. The Condo was needing a little extra love like updating and some deep cleaning. There was an odor coming from the garbage disposal but they have contacted me to let me know it has been fixed right away. The room was comfortable for our short stay. " Inverness Condo #302 is a very nicely furnished and maintained property. There is a new and beautiful full sized refrigerator. We had 6 in our party and were well accommodated. The pull out sofa bed is probably best for children. The only negative is that we could only receive one tv station..but,fortunately it was the Cartoon Channel"
The apartment was very nice, across the street from Schlitterbahn, on the Comal river. When we had an issue with an uncomfortable sleeper sofa mattress, it was resolved with a smile the same day. The management is most accommodating and helpful. "